A PM is a Private Message sent from one member to another. To send a message, click on My Messages on the top bar, then click on New Message, which you will find on the left. You will get a reply box, fill in the name and subject and type your message. Underneath the post is preview then click send. Another way to send a PM to a member is to go to their post and below the avatar is a balloon. If you hold your cursor over it you will see Personal Message. Click on it and it will take you to the box in the above picture with the person's name already filled in. Note when you receive a notice of a pm in your e-mail account DO NOT reply from your e-mail. You need to reply through the forum for the message to get to the intended person. 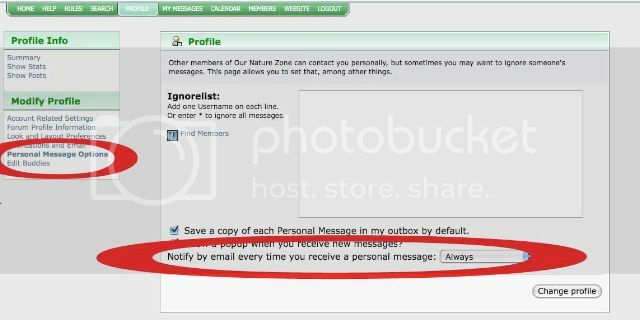 In order to read your messages click on My Messages on the top bar of forum, click subject. It will take you to that message. Note: Your Inbox at My Messages can hold 100 messages, then it is full and can't receive any more until you delete some. If you wish to receive notification that a Personal Message has been sent to you, you need to set your preferences in your profile. If anyone is having trouble with the forum please feel free to pm me for assistance. If you click on the square bubble under my Chickadee/avatar it'll take you to a pm box.